The Alexandria, Virginia art gallery Art Whino is set to launch a show called Texas MADE: Spotlight on 10 Emerging Texas Artists on March 21, 2008. Much of the art is graffiti-based or -inspired and really showcases some of the more talented stuff that’s coming from the Lone Star State. I encourage anyone in the area to swing through to see how us Texans are capable of more than is stereotypicallyrepresented. Showcased artists include CUTTHROAT, DARK, DUAL, Justin French, DMISE, PixieLife, stncl.07, ENKS, Scotch! and Dave Lowell. Show runs until April 4, 2008. Thanks to Bobby S over at the Kitsune Noir blog, desktops around the world will now be more stylish as they launch The Desktop Wallpaper Project today. Each Wednesday you can mosey on over the +KN blog and pick up a new wallpaper from one of the most talented artists practicing today — all free. Today’s contributions come from Tim Biskup, Mcbess and IMAKETHINGS. I’ve been waiting for an idea like this to come along for some time. Each wallpaper is available in a variety of sizes, including custom versions for iPhones and PSPs. Enjoy! Once again, the Hoops have made a tweak to their uniforms. This time they have ditched the alternate gray hoops that they had last year in favor of a new blue look. The N. Period is not really into these, let us know what you think in the comments. Among my beefs: 1) I don’t like how the top red hoop merges with the red on the shoulders, would rather have it contrast like on the away uni. 2) The shorts, with their broad colored stripe across the bottom edge, seem like they come from another kit altogether. 3) What’s with the downcast stripes? 4) I’d like to see a collar, even if it’s a small one like Brazil has worn. 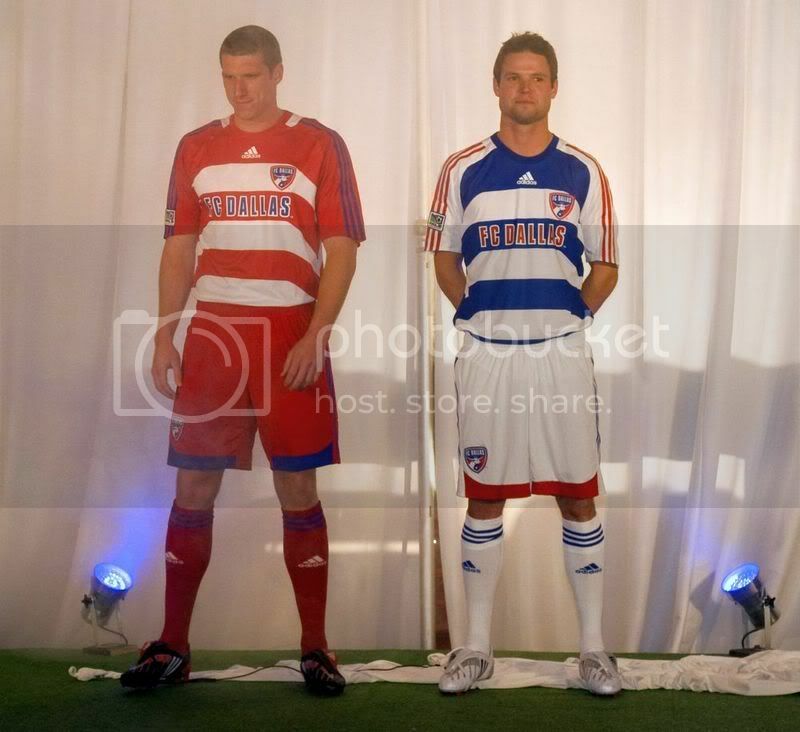 We just can’t recall a classic design like the hoops being made to look so dismal, and this is coming from fans of FC Dallas.